Kube Solutions, formerly Ice Kube Systems, has been manufacturing heat pumps for use in the geothermal industry since 1995, and our patented products and technologies have made us one of the leading providers of modular commercial HVAC systems. Our mission is to provide clients with the most advanced, economical and cost effective mechanical system possible. These high efficiency geothermal systems provide low energy consumption and low maintenance costs. The value of the Kube system is in its simple design and its proven performance record. 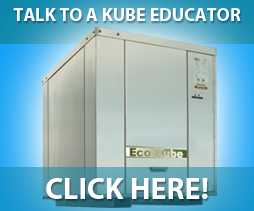 Kube Solutions’ heat pump design is one of the leaders in energy efficient building systems. The heat pumps are designed to move energy from one area of a building to another, or supply it to an adjacent building. If the hot or chilled water can’t be used directly, it’s used to heat or cool thermal mass so a portion of the heating or cooling energy can be used when it’s needed.